The USA Triathlon Foundation was created in 2014 by the USA Triathlon Board of Directors as an independent tax-exempt 501(c)(3) entity. Under the leadership of its Trustees and Committee members, the Foundation serves as a means to create a healthier America through triathlon, and seeks to transform lives by opening up new pathways to the sport for all, especially those who are otherwise underserved. The USA Triathlon Foundation operates with the belief that every child should have the chance to participate, every paratriathlete should have the opportunity to compete, and every aspiring elite athlete should be able to chase his or her Olympic dream. Since the Foundation’s inception, more than $1.9 million has been provided to worthy causes and organizations that support its mission. 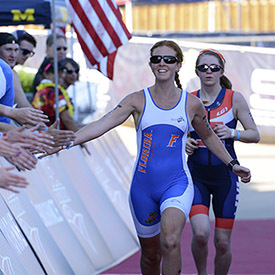 Donations to the USA Triathlon Foundation ensure America’s youth are introduced to the benefits and fun of a multisport lifestyle, athletes with disabilities receive the training, support and gear to be able to participate and excel, and the best aspiring young athletes have a chance to pursue their Olympic Dreams. Visit usatriathlonfoundation.org to learn more and donate today.